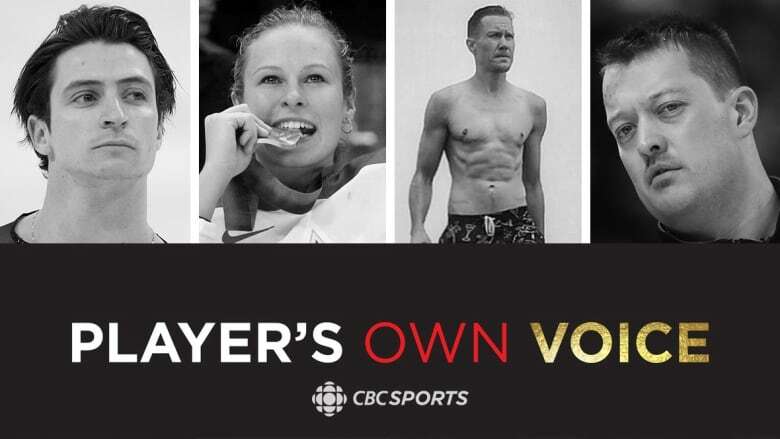 Like our Player’s Own Voice essay series, CBC Sports' new POV podcast gives athletes an unfiltered way to speak to Canadians on topics that run from the lighthearted to the profound. Top Canadian athletes like Scott Moir, Tessa Bonhomme, Chris Mosier and Ben Hebert open up on CBC Sports' POV podcast. CBC Sports is bringing you closer to Canadian athletes with a brand-new podcast. Like our Player's Own Voice essay series, the Player's Own Voice podcast gives athletes an unfiltered way to speak to Canadians on topics that run from the lighthearted to the profound. This isn't your typical, boilerplate jock talk. Listen in as host Anastasia Bucsis, a two-time Olympic speed skater, and a lineup of exciting guests share honest thoughts and memories — and a fair bit of ribbing — about the athletes, teams and competitions that have mattered most to them. New episodes of the POV podcast will be released every Tuesday, starting today with our first four featuring guests Scott Moir, Tessa Bonhomme, Chris Mosier and Ben Hebert. Moir, one of the greatest figure skaters in Canadian history, manages yet another graceful dance in his conversation with Anastasia. He recounts, among other things, how he negotiated romance in his personal life while being judged for his performance of a relationship on the ice with Tessa Virtue. Bonhomme has been a star in every sport she ever played, but hockey is where she shone brightest. A pro in the CWHL and a national team defenceman, Bonhomme helped Canada win Olympic gold over the U.S. Her on-ice arsenal includes a knack for chirping, and that wit serves her well in her current job as a TV reporter. Tessa and Anastasia huddle to talk about life inside the hyper-competitive bubble of the Canada-U.S. women's hockey rivalry. The first openly transgender athlete on a U.S. national team, Mosier is a duathlete, triathlete and role model for a generation of LGBTQ2S competitors. He and Anastasia explore questions of gender equality and steroid use. The issues that are testing sport governing bodies every day are embodied in Mosier, who needs regular injections of testosterone in order to be himself. His perspective on his own newly encountered male privilege should give everyone pause for thought. Hebert, an Olympic curler, takes a back seat to none when it comes to speaking his mind. Sure, that fast-talking tendency will get him kicked out of beer league hockey games, but it also makes him a hilariously honest friend. Ben and Anastasia have a meeting of the minds on the subject of competing at the highest level, and being driven athletes who also need to find a place off the ice in regular society. Subscribe to the podcast and each week you'll get another revealing conversation with a high-performance Canadian athlete. Player's Own Voice is available for free on iTunes, Google Podcasts, Stitcher or wherever you get your podcasts.